Ten years ago, if someone told you that Hyundai would be one of the biggest must-see attractions at the 2014 SEMA Show, you might have to do a double take. In the past couple of years, though, the Korean brand has created some jaw-droppers. For proof, look no further than the 1000-horsepower Genesis Coupe that premiered at the 2013 event, which used a completely rebuilt and boosted V6 to produce almost three times the power of the stock car. It doesn’t look like you’ll be seeing another Hennessey-esque Hyundai this year, but what the brand has readied is pretty impressive nonetheless. 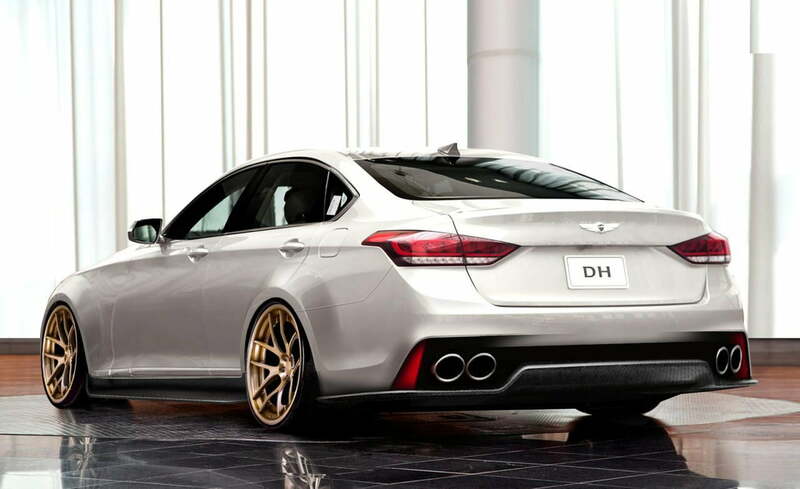 Tuned by ARK Performance Inc., Hyundai’s sixth SEMA vehicle is a supercharged Genesis sedan dubbed the AR550. Using the 2015 Genesis’ 420-hp 5.0-liter V8 as a starting point, ARK has added a Rotrex supercharger kit, a race-spec driveshaft, a performance intake, and an upgraded engine management system to produce 550 hp. The car’s suspension and aesthetics have been heavily modified as well (the wide-bodied Genesis wears an AirRex air suspension system and lightweight forged wheels), but Hyundai paid special attention to the soundtrack of this car. To help the blown V8 breathe, ARK bolted up a high-flow downpipe, a catted test pipe, and a thunderous GRiP exhaust system. Clearly, the Korean automaker wants to make an audible statement this year. In addition to the Genesis AR550, fans should look out for the radical, 708-hp Hyundai Sonata crafted by Bisimoto Engineering. You’ll be able to notice it by its huge, GT-style rear wing. I mean, how many of those could there possibly be? The Sonata may not have as much grunt as the 1000-hp Genesis from last year, but given that its 708 ponies have been extracted from a 2.4-liter Theta-II four-cylinder, its spec sheet is quite striking to say the least. The 2014 SEMA Show runs November 4th to November 7th in Las Vegas, Nevada.